This foodstuff, of a high nutritional value, rich in protein but low in cholesterol and fat, is the main ingredient in our formula. 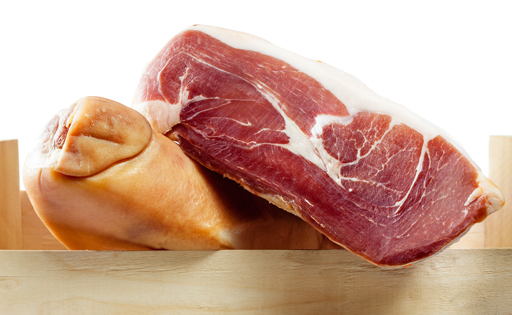 Cured ham is a high-quality meat rich in B-group vitamins (B1, B3 and B6), which are essential for your dog’s metabolism to work correctly. It also contains oleic acid, minerals like iron, phosphorus, potassium, sodium and zinc (fundamental for the immune system, growth and development). • Vitamin B6 or pyridoxine prevents disorders in the skin and mucous membranes, whilst contributing to the perfect functioning of the liver and central nervous system, as well as encouraging blood formation. • Vitamin B1 or thiamine (contains 0.75 mg/100g) is responsible for keeping the heart, brain and nerve cells healthy, maintaining a healthy appetite and improving mental agility. • Oleic acid boosts the production of HDL (good cholesterol) and helps to reduce LDL (bad cholesterol). This means that muscular disorders can be prevented.